Summer is here (at least in Colorado!) and it’s time for some more mosaic classes! I’ve scheduled two for this Summer; Outdoor/Garden Mosaics and Beginner’s Mosaics. Both classes consist of 2 sessions and come complete with all the instructions, materials, skills, and knowledge you will need to complete either Outdoor/Garden mosaics or Beginner’s-level indoor mosaics! Outdoor/Garden Mosaics Class: Two Tuesday Evenings, June 3rd and 10th 2014; 6:00 – 9:00 pm (5:30 pm start if ALL students can start then) at a Southwest Lakewood, Colorado location. Cost: $150 class fee + $25 Required Materials Kit Fee to make one complete outdoor piece. In this fun and fully interactive course, learn how to make your own outdoor or garden mosaic art piece with a variety of glass, tile, or other weather-friendly materials. Choose from a stepping stone, flowerpot, address or garden plaque, garden stake, or consult with me about bringing your own base that you want to mosaic for the outdoors or garden. These project bases are included along with the tiles, misc. other materials, adhesives, grout, sealer and all other supplies needed to make one piece. You will learn the basics of making mosaics for an outdoor environment; correct bases/substrates to use with which adhesives, which tiles/glass/tesserae, and which grouts and sealers. You will complete an original design on your base, learn how to and then grout and seal the piece to best protect it from the outdoor elements and leave class with one completed piece. This is a true class, with handouts and references, and the knowledge and skills learned to make more outdoor/garden mosaics. Click Here for more information and to register securely online through EventBrite. 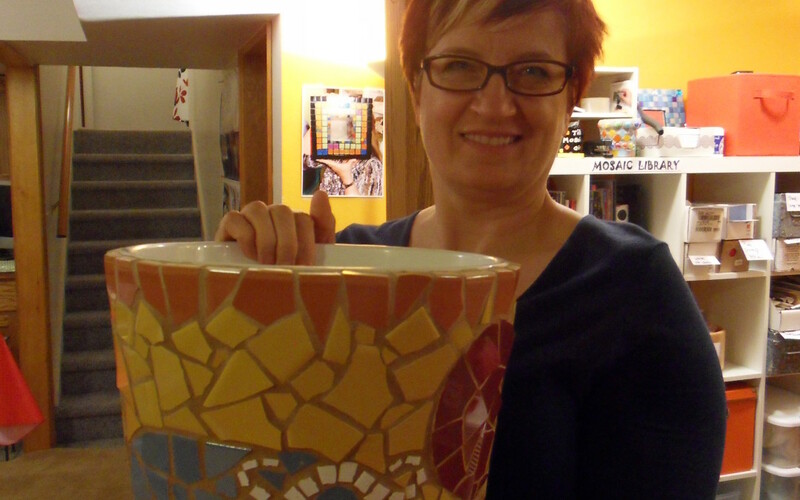 In this fun and fully interactive course, learn to make your own (indoor) mosaic art piece! Choose from several project bases (frames, plaques, mirrors, etc. ), which are included along with ceramic & glass tiles, adhesives, grout, and all other supplies. Students learn the basics of cutting, shaping, arranging, and adhering tiles and complete their design. They go on to learn how to grout and seal their piece and complete the grouting to “bring their piece to life”. 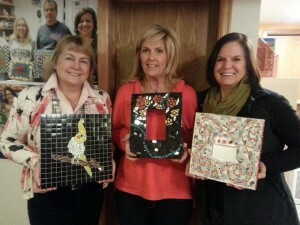 This class will help you learn how to make INDOOR mosaics; the correct bases, adhesives, tiles and materials (“tesserae”). This is a fun, stress relieving course; absolutely no previous mosaic experience or ‘artistic ability’ required; come see how easy it is to tap into your creative spirit and learn this wonderful craft! Click Here for more information and to register securely online through EventBrite. Both classes are kept deliberately small to allow enough student and teacher interaction and attention and registrations are taken through EventBrite.com on a first-come, first-serve basis. PRE-REGISTRATION REQUIRED: No spaces reserved without full payment.